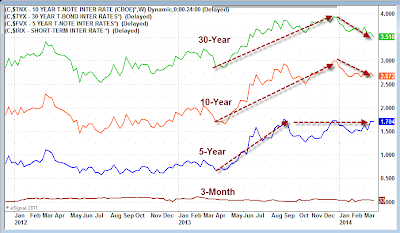 Curve Watcher's Anonymous has its eye on the yield curve again. Over the course of the last year, and except for the close front-end, US treasury yields have risen across the board, and in some cases dramatically. 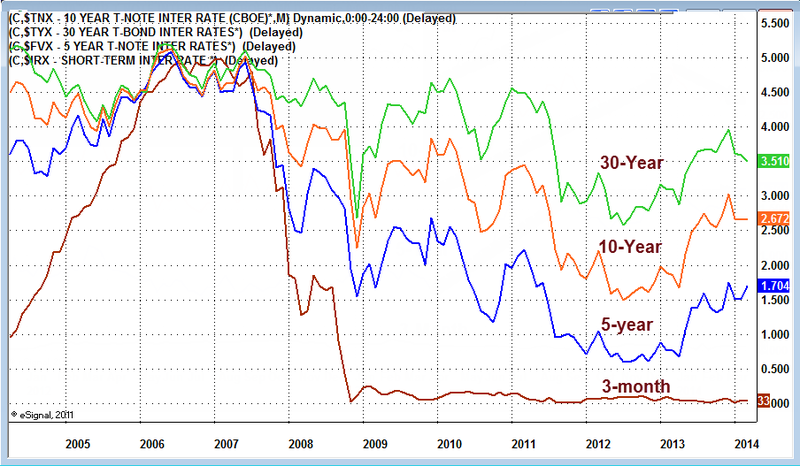 This is what one would expect from a tapering Fed that is also discussing rate hikes. However, the action in the last three months is not what one would expect. 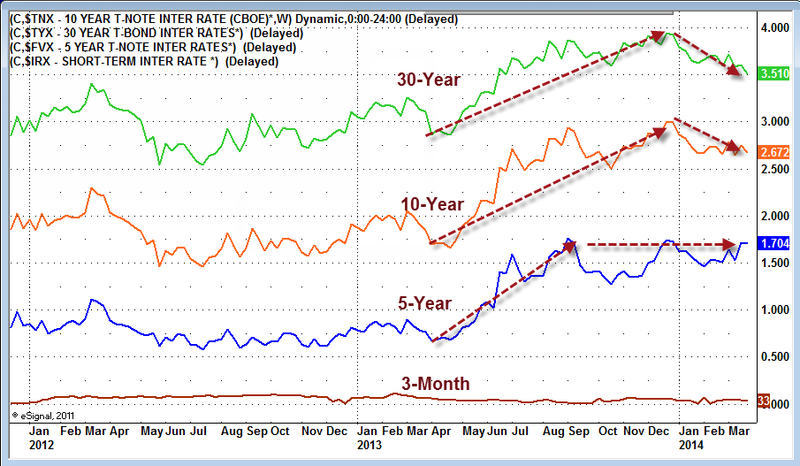 In the past year, 5-year treasuries have been hit the hardest (sharpest yield increase). That is not what one might expect from a strong recovery. 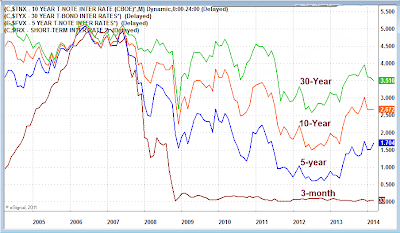 And certainly a drop in the 30-year long bond is not what one would typically expect either. Typically, when the Fed starts hiking or announces intention to hike, the long end of the curve changes the most. It did, until the beginning of the year. The following charts will help put things in perspective. The above chart shows monthly "closes" where the yield was at the end of the month. The current month shows the present value. The above chart shows weekly "closes" where the yield was at the end of each week. The current week shows the present value. Since the beginning of the year, the middle and long portion of the yield curve has flattened dramatically. The "sweet spot" for investors has been the long end of the curve. Those hiding in 5-year treasuries have been hit the hardest. Given the Fed is holding the low end of the curve near zero, the typical inversion one sees in the yield curve preceding a recession is not going to happen. We could see the 5-10 spread invert but that would take some doing. Regardless, this flattening of the curve is certainly not a sign of a strong recovery. Given blatant Fed yield curve manipulation, this may be as close to a recession warning that we get.